Naskeag Point, one of my favorite places on the Maine coast. The Eggemoggin Reach ends at Naskeag Point, where Harbor and Hog Islands frame the small harbor. The splendid shores of Eggemoggin Reach, as seen from Neskeag Point. My faithfull companion, Hattie, tests the cool waters of Eggemoggin Reach. 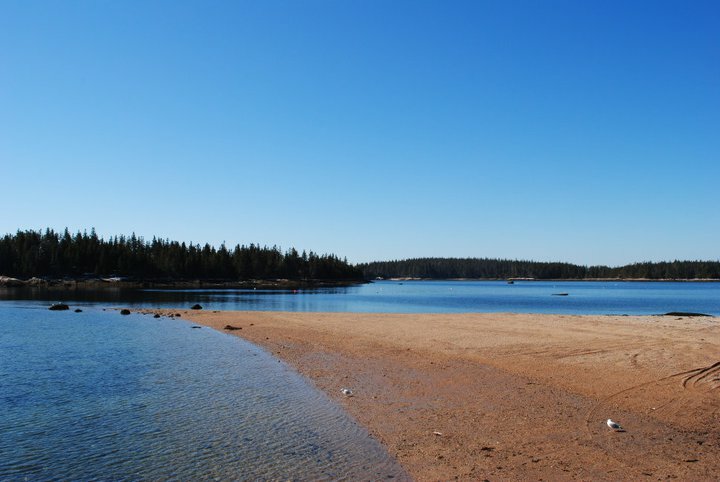 Naskeag Point is a sandy slice of heaven at the southern end of the Blue Hill Peninsula. Looking east toward Blue Hill Bay. A local clammer searches for a muddy spot to dig. I will never forget the first time I came upon Naskeag Point. It was late May and I had come to Blue Hill to visit a friend for the afternoon. After our visit, I decided to drive down Route 175 to Brooklin, the self proclaimed "wooden boat capital of the world." I had never been to this small hamlet at the southern end of the Eggemoggin Reach, and after that day, I never wanted to leave! I discovered Naskeag Point that afternoon, a stunning sliver of sand that is easily one of my favorite places on the Maine coast. There is just something about this place. Tall spruce trees line the quiet road to the point, which is filled with old farmhouses and spectacular views of Mount Desert Island. There is a classic white farmhouse at the entrance to the point. It stands at the edge of the water, blending perfectly with the surrounding land, as do so many other rambling houses in Downeast Maine. There is a small pond in the back of the house, and a giant field that leads down to the sandy shores of Eggemoggin Reach. At low tide, Naskeag turns into a small beach where local fishermen park their pickups before pushing their skiffs out to sea. Harbor and Hog Island protect the point from the southwest, while providing the perfect Maine coast backdrop of spruce-clad islands and brilliant blue water. Blue Hill Bay sits to the east, Center Harbor to the west. At low tide, the point turns into a muddy haven for local clam diggers. I have met diggers who come all the way from Belfast to rake the mud of Naskeag. The water is incredibly clear here, the trees awe-inspiringly tall, and the breezes intoxicating. If you find yourself in Brooklin this summer, take a few hours to explore one of the most beautiful places on the coast of Maine!